When it comes to home design, one of the areas that is largely neglected is the basement window wells. So much attention is given to the interior of the house that the majority of people simply install the same old generic, metal wells. At Rockwell Window Wells, we are looking to change this with our decorative, unique egress window wells. But what is an egress window? In this blog post we briefly explain what they are and how installing Rockwell egress windows can improve your home. The definition of egress according to Merriam-Webster is “the action or right of going or coming out” and “a place or means of going out”. Essentially an egress window is a basement window that also provides a “place or means of going out” in case of emergency. Egress windows are built with a form of ladder or stairs built directly into the side of the well making escape from any basement quick and easy. Egress windows have become increasingly popular in recent years as they go a long way in helping to improve the safety of any home. While there are many different designs of egress windows, Rockwell’s unique design stands out from the crowd. 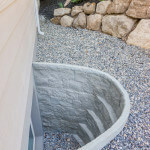 Rockwell egress window wells go a long way in improving your basements aesthetics, safety, and lighting. Rockwell Window Wells stand out due to their unique design from other egress windows. Unlike window well liners, our window wells have a stone texture that truly looks and feels like real stone, adding great curb appeal and an aesthetically pleasing view both inside and outside of the house. 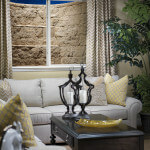 The stone texture helps to improve the look and feel of any basement when compared to other window well options. As well as improving the overall look of a basement, Rockwell window wells help to make your downstairs living space feel larger and more inviting. These windows not only look great but put a high priority on safety as well. As will all egress windows, Rockwell’s make escape in case of an emergency as easy as possible. Rockwell egress windows come with built in steps so that no ladder is required to be purchased. 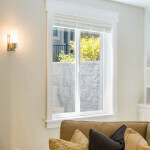 Egress windows also help to improve the lighting of any basement space. Due to how far the window wells extend from the house, the amount of natural light that is allowed to enter is greatly increased. This added lighting helps to make your basement much more inviting of a space during the day. Egress window wells can be a great addition to any home. In addition to easily improving the safety of your home, they can also improve the aesthetics and lighting of your basement space. To learn more about purchasing and installing egress windows into your home or for any window well needs, contact us at Rockwell Window Wells.